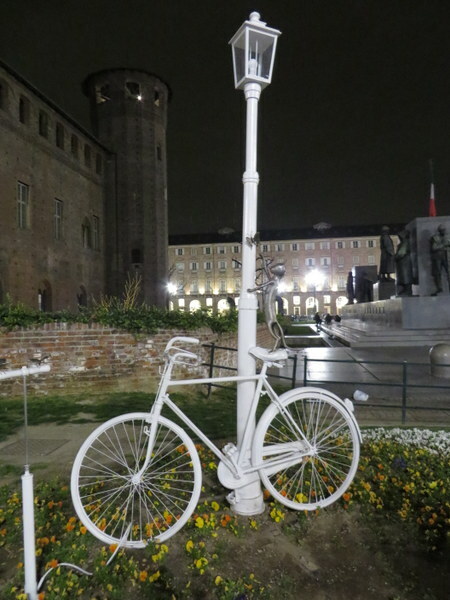 We made a mistake when we visited Torino: we didn’t stay long enough. The trip was a celebration for Ric’s birthday and the goal was to take the longest train trip possible from Rome on a high-speed Frecciarosso. Torino was a match for that plan, 4 ½ hours each direction, so we set out on the morning of Ric’s birthday expecting to find a pleasant enough city, have a good dinner, then another long train ride back to Rome on Sunday. No driver! 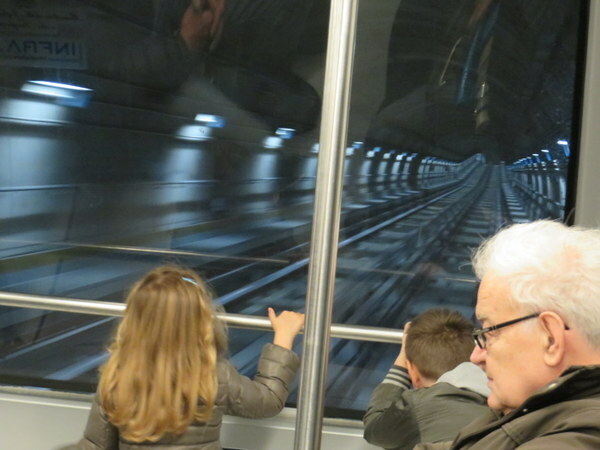 Passengers are free to observe the “view” of a clean tunnel as the train whizzes along. The train is such a joy! Faced with a 4 ½ hour flight I want to slit my wrists, but 4 ½ hours on the train facing my sweetie across the convenient table, gazing out the window, with time to read, nap, and surf the internet, is so fine! The stewards come by with coffee and little snacks, and of course there’s a bar car for light meals and wine. Certainly beats flying. 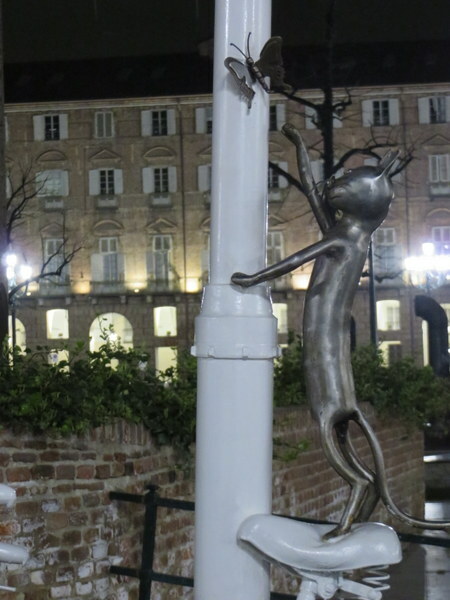 Torino is indeed a pleasant city. Much of it is new-ish due to heavy damage in WWII, but the predominant architectural style is Baroque. It was the first capital of reunified Italy in 1861 and home of Italy’s royal family, the House of Savoy. Today it is “Motown, Italy:” the headquarters of Fiat, Lancia, Iveco, and Alfa Romeo are here. Happy passenger in the Torino Metro. smart choice. After a quick lunch, Ric chose the Museo Nazionale dell’Automobile (The National Automobile Museum) as our first stop. I was prepared to be bored, but hey, it was his birthday so the agenda belonged to him. After all he succumbed to my whims for my 5-day birthday celebration last month. 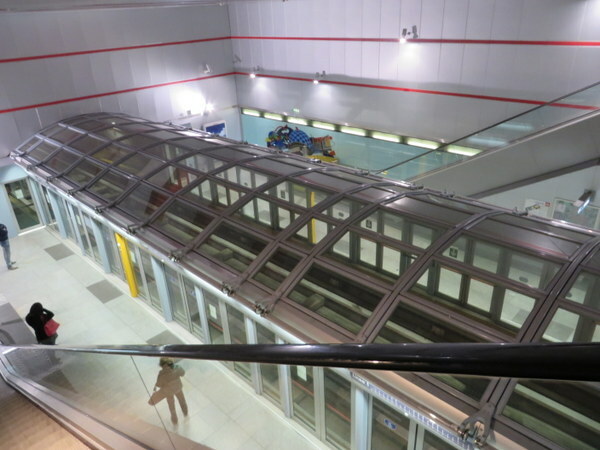 The first pleasant surprise was the Metrotorino: sleek, modern, Habittrail-like, no graffiti, no crowding, no noise…and no driver! Metrotorino whisked us to within a short walk of the museum. Boredom was not the emotion I felt upon entering. This is an amazingly well-curated exhibit of over 200 vehicles in 200,000 square feet! The collection includes an 1896 Bernardi and an 1899 Fiat, as well as cars by Rolls Royce, Peugeot, Ferrari, Alfa Romeo, Benz, Oldsmobile, and more. There are Formula One cars, family cars, a mock assembly line, films, WWII vehicles, models, perspective on the changing world of automotive transport, man-machine interaction, etc. I decided the tube the Metro runs in resembles the hamster set up Derek used to have, a Habittrail. I thought the Museo Nazionale dell’Automobile would be a bust and was amazingly surprised. I had looked forward to the Museo Nazionale del Cinema in the Mole Antonelliana. While it certainly documents the development of film, it was a bit heavy on old equipment and artifacts from the earliest days of the cinema. The building itself is fabulous. As we were there at night, and a rainy one at that, we skipped the panoramic elevator noting we need to return on a clear day. Click any picture below for a slide show featuring some of the exhibits in the Museo Nazionale dell’Automobile. And on that note, we really do need to return to Torino. We missed the Egyptian Museum, the Baroque and Rococo palazzi , not to mention the gardens and shopping. The food was excellent and for our single dinner in the city we were fortunate to select Sotto la Mole. It is very small and intimate with a limited menu, beautifully prepared and served. Torino is at the foot of the Alps, close to the French border, and the Piemonte Region is well-known for its food and wine. The Alps here beckon for summer exploration, so we will be back and spend more time in Torino on the way. Thanks for the photos of the autos. I have always loved regal autos – something we do much more rarely these days. 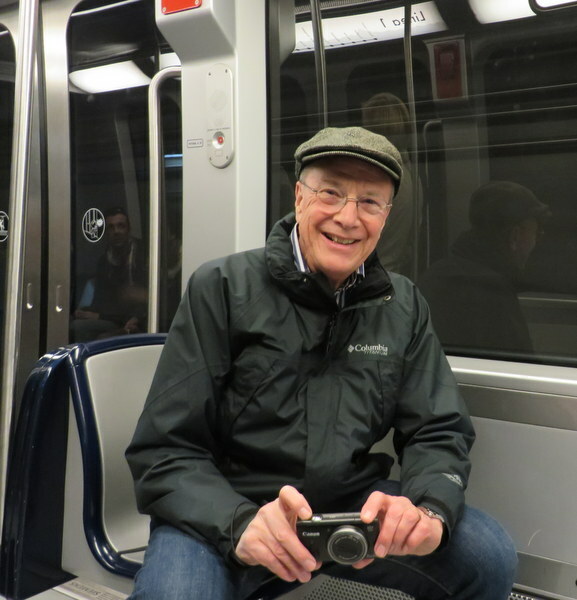 And the train ride – if it was at all like our Swiss train rides – and I suspect it was better – then it was MUCH nicer than flying. THANKS!